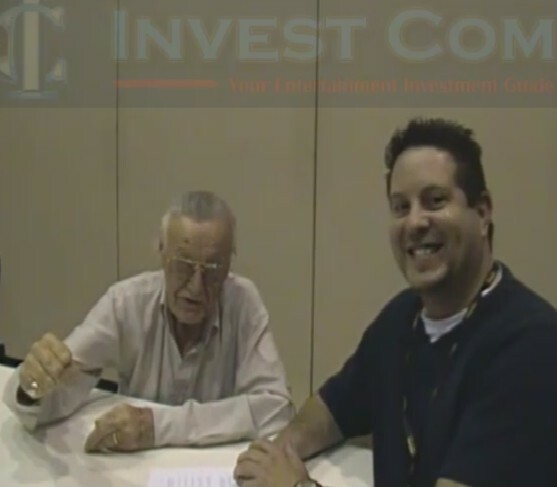 Well here it is fans, the InvestComics Interview with Stan “The Man” Lee! Was I nervous? Yes. Did I look it at times? Yes. Did I mess up at times? Yes. But all of that doesn’t matter to me personally. What matters is that I spent some time with a person that I never thought I’d ever get a chance to sit down with. An Icon within the Pop Culture realm…..a Legend. It all still seems so surreal, but it happened and I will never forget it. Although this “mini interview” took place in February of 2012 and only clocks in at 5:59, I had a real problem with the audio track, hence why you are seeing it now. So BIG warning here, I DO NOT claim that this is good audio and at times you cannot even hear what Stan says! Through trying to enhance it, drop the noise reduction, add this add that along with a slew of other technically gobbledygook that I’m still trying to figure out I finally realized that it is what it is and that’s it! Sometimes you have to just succumb to the realization that you have to just make do with what you have and hope that it comes out decent enough for some to enjoy. Yes there will be cynics out there, but that’s to be expected and honestly I really don’t care because not many ever get to have a personal mono y mono with the Legend himself. I did not get to spend as much time as I wanted with Stan. That said, I did have to cut out a lot of the video as well as having very cool “personal time” speaking with him that did not make it into this video. So I had to salvage as much “quality” video as I possibly could. The end result equated to 3 questions. Although it may not seem like much, ANYTIME spent with a one on one with a Legend is time you will have forever. I tried to make it a bit easier with laying out the questions within the video so that no one would have to sit through “more noise” while the questions are asked and are hard to hear. Yes there is lots of noise, lots of distractions, but it was a spur of the moment setup with not much preparation to get everything lined up the way it should have been. Oh well, C’est la vie. The 3 questions are listed below. There are two personal favorite parts within this Interview. One was at the 1:57 mark where he is quoted at the beginning of this write up. One of the few parts that can be heard clearly and concisely! The second is at the 5:25 mark. Besides my big Kool Aid smile at that moment when Stan proclaims his battle cry, take a look at the kick Stan STILL gets from doing that. That’s a passion that is not matched by many these days. 1 – Stan, tell us about Pow Entertainment. 3 – With digital comics making their way into the medium, do you think paper will ever go away? Stan Lee’s Pow Entertainment website can be found by clicking right HERE. Stan Lee’s website can be found by clicking right HERE. 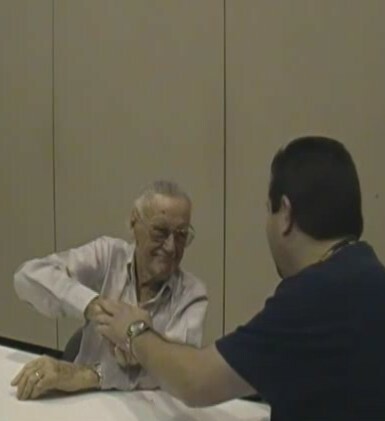 In closing; Stan Lee was both humble and gracious when I met him. He spoke to me as though he knew me for all of my childhood. Funny thing is, Stan did know me for most of my childhood. He knew many of us. I’m glad I got a chance to thank him for making me escape and believing in my favorite heroes. There is no creator out there that has the stature that Stan Lee carries. He’s a unique individual that has captivated, inspired and done so much for an industry that I am happy to be a part of. Thank you to all the supporters out there, your positive attitudes and words carry me very far. Heck yeah man! Great to see this up at long last!